William & Mary Law School Dean Davison M. Douglas accepted an award on Wednesday in recognition of the school’s designation as the number one “Military Friendly” Graduate School in the country. Brian Hucik, National Program Manager for the “Military Friendly” rankings, presented the award to Douglas during a reception in the school’s Hixon Center attended by students, faculty, staff and invited guests from the Virginia Department of Veterans Services. Hucik said that the rankings recognize schools’ “commitment, effort and success in creating a sustainable and meaningful opportunity for the military community.” The VIQTORY company has sponsored the rankings since 2004. It determines the ranking based on an assessment of public data available for more than 8,800 schools nationwide, input from student veterans, and responses from schools that complete the company’s annual survey. 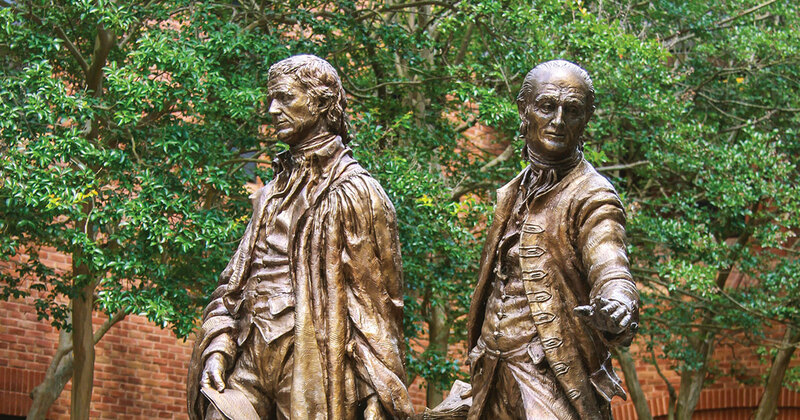 Douglas said the recognition seemed especially fitting for William & Mary’s law school since it can trace its students’ military service back to the time of the Revolutionary War. He also acknowledged the contributions of the Virginia Department of Veterans Services, as well as the efforts of many individuals at the school and university, such as Professor Fredric Lederer, who have been important sources of support for students who are veterans or are active duty military personnel. LT Jennifer Carroll, an active duty Naval officer and third-year law student, has the distinction of being one of the first three female officers to qualify in submarines. In her remarks at the reception, she recalled “being thrilled to find such a high quality law program just up the road” from her duty location in Norfolk. She said that active-duty officers and veterans often experience something akin to “culture shock” as they navigate the transition from the military to graduate school. Any apprehensions she had were lessened on her first day of school when Dean Douglas extended the school’s welcome. “Overall, I’ve had a wonderfully positive experience at William & Mary and I am so appreciative that we are being recognized with this award,” she said. Professor David Boelzner, co-director of the Puller Veterans Benefits Clinic, closed the program by presenting Hucik, an Army veteran, with a challenge coin. The clinic created its challenge coin in 2011 to acknowledge service to veterans by students or friends of the Law School. The coin features the clinic's name and the university cipher on one side. The reverse side features a compass, symbolizing the clinic's commitment to helping veterans in need navigate the challenges they face after returning home. Circling the compass are the clinic's motto, "Serving Those Who Sacrificed," and its core values: "Selfless Service," "Professionalism," and "Heroism."